A major innovation for improved insulation, better resistance and greater protection. A seven-year warranty… Who can top that? Water tightness is a key feature of your motorhome; at Chausson it’s guaranteed for seven years (with an annual check-up by a certified network member). The extent of this warranty goes well beyond the standards of the profession. It’s the best pledge of peace of mind that Chausson can give you. 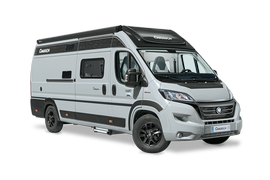 Our network of dealers is made up exclusively of true recreational vehicle specialists who know Chausson backwards and forwards. Chausson offers one of the market’s most extensive and best-equipped European networks. They’re synonymous with outstanding practicality, excellent quality, easy handling and top safety because they can’t be removed from the outside. At Chausson, well-being is also important. Two, and even three, standard doors to make loading easier and more optimal. Your back will appreciate this handy storage solution that’s easy on your muscles! The sturdiness of our motorhomes is no accident; it’s the result of choosing strong materials. For chassis extension, we use galvanized steel reinforcement that’s more robust and long-lasting. You can use all our heating systems on the road with no constraints. This is ideal for your passengers and very handy for heating the unit before you stop for the night. 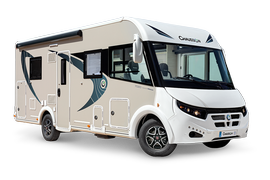 At Chausson, we’ve chosen reference brands that are able to supply a specifically designed chassis for the motorhome, and we have a specially equipped after-sales network trained in the leisure vehicle market. Easier access is not a minor detail; it’s essential! There’s no need to unfold a step plate, it’s built in (except on the 620), for a more stylish and handy access. You won’t need a fistful of keys! just one key for the carrier. Most of our beds over garage holds (except for twin beds) can be height-adjusted over a distance of 30 cm. Most of our beds over a hold can be raised for easier access to the storage areas. It doesn’t take much experience with motorhomes to know that ventilation in the bathroom is essential. At Chausson, all our bathrooms have both an opaque window that can be opened and a skylight in the roof. Whatever the version, all our motorhomes are equipped with elegant rigid partitions, never with a PVC curtain. To avoid any risk of infiltration, bike carrier adapters are installed as standard equipment so that you won’t have to drill holes. All you need to do is choose your bike carrier! To reduce mounting time (and workshop costs), all our motorhomes are pre-cabled for a back-up camera you can order from your dealer. Whatever the version, all our motorhomes have at least one 230 V/12 V TV-antenna outlet. 100% LED lighting provides ten-fold savings in energy and a product lifecycle that is thirty times longer. A bright choice for you and the planet! Night lighting is designed for a cozy atmosphere and for your safety with built-in LEDs near the floor. The foam in our cushions has been specially designed to offer firm seating comfort (without sagging over time) and high-quality, resilient support for your back. For greater passenger comfort, each road seat is equipped with a height-adjustable headrest. Whatever the version line, all our drawers have cushioned closing and latches to avoid accidental opening when you’re on the road. For easier circulation and greater comfort in the living room, all our low profiles have a central table that can be adjusted in height (telescopic pedestal), longitudinally and crosswise. Only some of our compact models (less than 6 m) don’t have one, simply because it’s not technically possible to install one. * For most of our overcabs, low profiles and A-Class.